Making all of the Eevee evolutions as fantasy themed gijinkas has been a dream of mine for a long time, and I started to realize this dream by making Glaceon in February 2018. Since I knew I would have the chance to shoot outside in the snow for a few months, it just made sense to start off with the ice type! I modeled the design after my idea of an ice/snow sorceress. 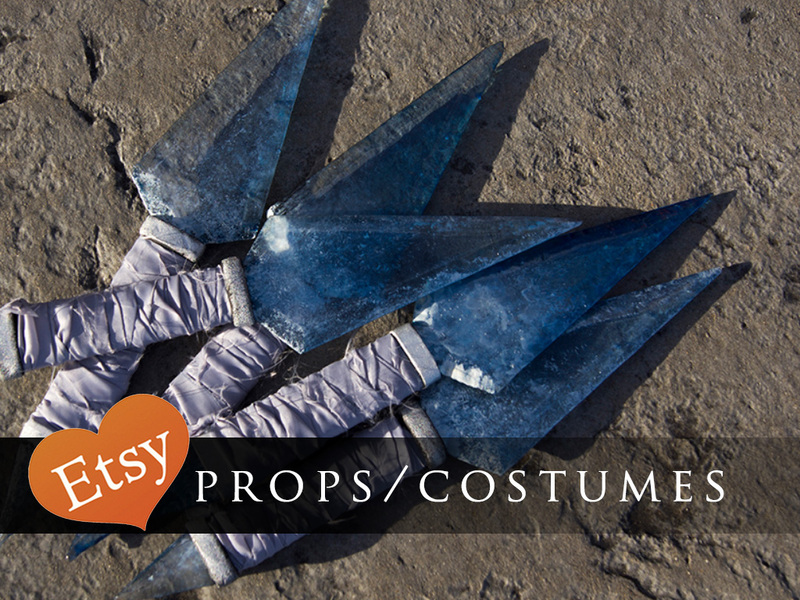 I like the idea of a character with mystical powers, but one that also keeps a weapon on hand for close combat, so I added some small ice daggers (which you can find in my Etsy Shop!) to the design as well! To make the long coat and hood I used two existing patterns, combined them and modified them to wear underneath my corset. I also made sure to line the bulk of the coat and hood with quilt batting to make it as warm as possible since I new I would be shooting outside in the freezing cold. The back of the coat, as you can see below, is modeled after Glaceon’s tail, and the white fur trim and cape was added because I thought it was fitting for a snow sorceress to have some long fur accents. The armor is made using EVA foam and Worbla’s Pearly Art, and the icicles on the pauldron are resin cast. My ears are built directly into the hood and supported with a Worbla’s Kobracast base and attach to my wig with magnets. Lastly, I custom dyed my wig to have the dark blue front and teal ends, reminiscent of Glaceon’s forehead crest. You can find a tutorial for the icicle pauldron HERE!